Once upon a time there was a girl who was insecure, anxious, depressed and avoided social activities for a fear of being judged. That girl was smart, supported and hardworking. In college, the girl would go home every Sunday for dinner with her family, sit at the table and cry about how much she hated school, her life and how she was sick and tired of feeling this way. She tried to change things, but none of what she tried seemed to work. One day, she was inspired to join a program that her aunt had completed before. She joined the program, put in the work and reaped the rewards. After it ended, she continued with her hardest effort, most focused mindset and an attitude that she could do it. And she did. From those days forward, that attitude changed her life mission. It became to teach others how to make the changes she did, to inspire, and to show that it was possible to live happier than thought possible. That girl is me. I’m Alexis. My story begins at over 230 pounds (231 at an official program weigh-in start, although it certainly was higher ). Where it climaxes:a 90-pound weight loss. And it became weight maintenance for the last six years. There were points where I considered suicide.There were more panic attacks than I can count and while it wasn’t because of my weight, it was. The weight covered the real me like a blanket–cocooned inside and unable to come out for fear of being judged. I was the fat friend. The quiet one, the goody two-shoes, the one that never had a boyfriend, was always around and would drop everything for anyone. While some of those things still stand, they were a mechanism for control and the safety I felt I needed. In losing weight, no one tells you about the struggles you might feel or go through during the process. They insinuate that it’s perfect and great! You instantly feel better! While part of this is true: my confidence increased, I was able to come out of my shell a bit, I focused less on what people thought of me, it also became some of the most trying times. Once I surpassed my original goal of fitting into a white Lilly Pulitzer dress, I made a new one of 150 pounds. Once that one passed, I needed something new. 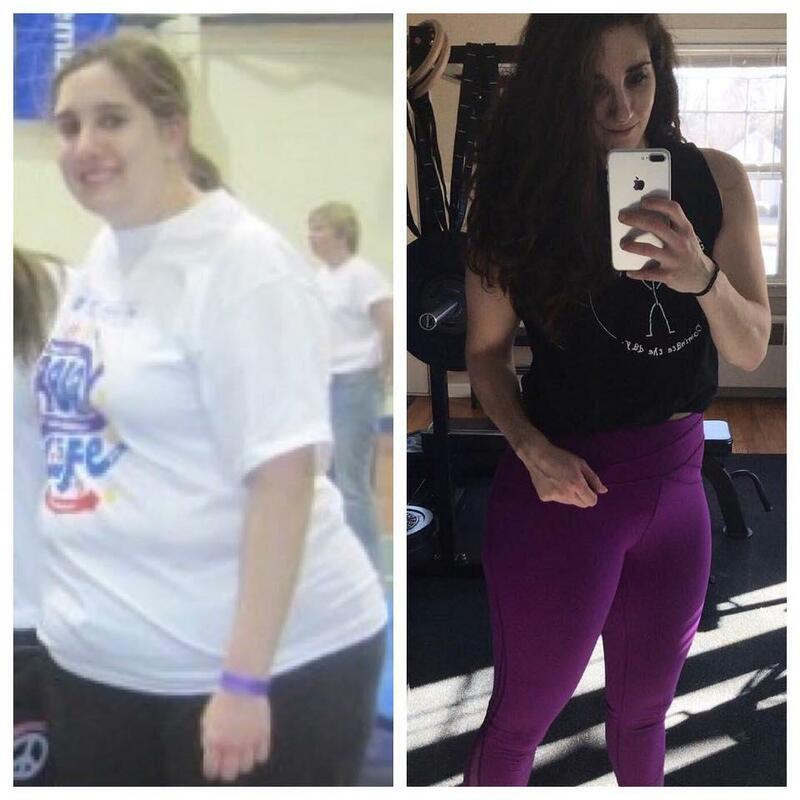 I became obsessive and drove myself into an eating disorder that my therapist wouldn’t recognize because “my weight wasn’t low.” I exercised for hours a day, 7 days a week. I eliminated foods from my diet, I ate 700 calories and then ran to burn it off. My eyes and face were sunken, I was pale and I had no energy. I was nervous to date anyone seriously because of lack of experience I also felt like I couldn’t open myself up to any new friends because they’d want to do things I didn’t want to do. I was trapped in my own mind and obsessive habits. It took a few years to reduce these habits. It took patience, changing my eating style and introducing new tactics to make eating enjoyable again, accepting that I might get a little bigger with more weight lifting. The recovery was harder than the original weight loss in a sense. It took more patience, precision and diligence to become free from the constraints of my food restriction and over exercising, to accept change and acknowledge that physical health was more important than physical size. I’ve maintained my weight almost effortlessly by letting go of the chains that prevented me from eating. I workout on average four days a week for an hour instead of seven. I do cardio because I enjoy it, not because I have to burn off things I ate. I have pants in a variety of sizes and it doesn’t bother me. Through all of this, I sought more – more information, more research, more trial and error. I pledged to help others so they wouldn’t have to not go through what I did, but help them become the person they want to be. I made it my mission to teach others how to lose and maintain their weight without obsession or extreme diets. I want people to feel good about themselves and enjoy the process. This past year, I quit teaching and became a full-time health coach/trainer, in a personal training studio I share with my boyfriend and online. In 2011, I probably would’ve told you about my dreams to be a well-known blogger/writer – I couldn’t have even dreamt of where I am today, but I couldn’t be more thankful for the journey. To those just starting, be patient and kind to yourself. Allow your body the respect it deserves.